Most transportation songs are full of remorse and contrition, but the convict of this ballad, Jim Jones, carries bitter scars and, in the last verse, takes solace in the possibility of revenge. Language can only give a pale imitation of the grisly reality of blood-soaked flesh being lashed away by a cat-o-nine-tails whip, or some other hideous punishment. 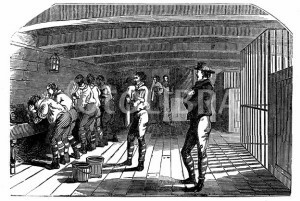 Despite the terrible pain, some men took pride in uttering no sound during the flagellation and referred to their flogging as ‘getting a present of a new red shirt’. I have always been amused by the reference to ‘pirates’ and why on earth they would want to attack a convict ship. This song first came to light when it was included in Old Pioneering Days of the Sunny South (1907 Goulburn) by Charles MacAlister, and included in the Stewart & Keesing edition of Old Bush Songs (1957). The tune is Irish Molly-Oh. Captain William Hill, commanding guard in a Second Fleet ship. The slave trade is merciful compared with what I have seen in this fleet; in that it is in the interests of the masters to preserve the health and lives of their captives, they having a joint benefit with the owners; in this, the more they can withhold from the unhappy wretches the more provisions they have to dispose of at a foreign market, and the earlier in the voyage they die the longer they can draw the deceased’s allowance to themselves; for I fear few of them are honest enough to make a just return of the dates of their deaths to their employers. My feelings never have been so wounded as m this voyage, so much so, that I shall never recover my accustomed vivacity and spirits; and had I been em-powered, it would have been the most grateful task of my life to have prevented so many of my fellow creatures so much misery and death. The Melancholy Fate of Captain Logan. Along with Port Arthur and Norfolk Island, Queensland’s Moreton Bay was feared for its harsh treatment of convicts. Under the command of Captain Patrick Logan from 1826, the death rate ran higher than one man in ten each year, no questions asked. This powerful song celebrates the death of Logan when speared by hostile Aborigines while he was exploring and surveying the Upper Brisbane River, in 1830. It was considered a fitting death for the monster of Moreton Bay. It is noted as ‘anonymous’ although usually ascribed to Francis Macnamara (Frank the Poet). The Queensland Centenary Songbook (1959), published this version as ‘Moreton Bay’ attributed to W.Bowden, Wide Bay, citing ‘Youghal Bay’ as the tune. It appeared to be based on Will Lawson’s version in Australian Bush Songs and Ballads (1944) as ‘The Convict’s Lament’. Lawson noted ‘The Manuscript of this rugged rhyme was secured by me in Queensland in August, 1916, from Jas. R. Scott (Deputy Coroner, Cessnock, and a collector of early Australiana’). The song was taken from a letter from Captain Clunie to the Colonial Secretary and published in the Sydney Gazette of 25 November 1830. The original is in the Mitchell Library collection, Sydney. Broadside Sutton. nd circa 1852. I was born in the year 1832, on the 17th day of June, and I am the eldest daughter of John Collins. My parents reared me in a proper and upright manner until I was 12 years of age, when they then sent me to a cotton factory to learn steam loom weaving. I was jilted in love, forced to the streets and eventually found guilty of theft. I received the sentence of 10 years transportation to New South Wales, where I have been for about 4 years. After we landed we were conveyed to the factory for female convicts. I was taken by a respectable family as a servant, and remained in their service until 1851. During that time they very kind to me and I only left through the death of the master. I was then turned over to another master, a very cruel man, indeed I cannot describe the hardships I endured under him. I being fed on the coarsest provisions, and compelled to work more like a horse that a human being.